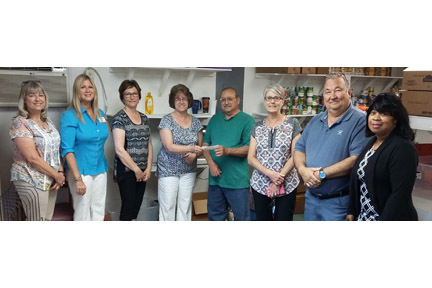 The Foristell Chamber of Commerce donated $500 to the Foristell Food Pantry. Operated by the Westplex Community Church of Foristell, the Food Pantry helps over 90 families in need from Warren, Lincoln and St Charles counties. The Pantry is open on Thursdays from 9-noon, and from 4-7 pm. Chamber Secretary, Aaron Baker said, “We are happy our chamber members are involved in the Food Pantry. The Foristell Chamber consists of local business who care about our community and we want to see everyone succeed.” Residents needing help will be served on a walk-in basis, and should bring their driver’s license and a utility bill for proof of residency. Donations of non-perishable food items, paper goods and cleaning supplies are accepted on an ongoing basis and can be made at the Food Pantry, 22855 Veterans Memorial Parkway, Foristell, MO. Jimmy Butler, and Lisa Alexander, The Lion’s Club.